Think of a recent presentation you attended. How involved did you get in that presentation? Did it make you think? Did it make you do something? Did you feel something? If the answer to those questions was YES, then the chances are you will remember the content and may have cause to draw on it ie you will take some action. Here is how you can manage the latter two factors. 1. If there are joining instructions, posters, notifications of a presentation, then use wording that excites and builds anticipation. A catchy title, an outline of what people will be able to do and know afterwards are essentials. 2. As people walk in the room, you (as speaker) need to demonstrate an energy and excitement in the way you welcome people, how you stand at the front, how you stand up to begin. 3. In your opening statements, forget the predictable ‘Hello my name is …and today I am going to talk to you about…’ Instead tackle the reason they are there. Make them hungry for what you have to say by highlighting the need. Tease them as to why they are here and how they will benefit from by listening. 1. Realise that as a speaker your role is make the audience work at least as hard as you do if not harder. 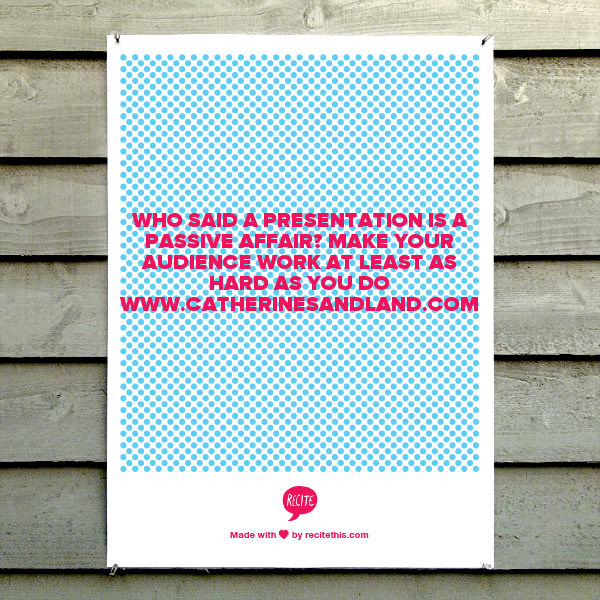 Understand that a presentation is an ACTIVE process for your listeners and make it so. 2. Ask lots of questions and then when you think you have asked enough – ask some more. Questions are brilliant ways of engaging people and helping them actively process your information. 3. Relate your content to the listeners’ experience again and again and again. Deliver your content for sure…and make sure that it is relevant for this audience and is tailored to them. 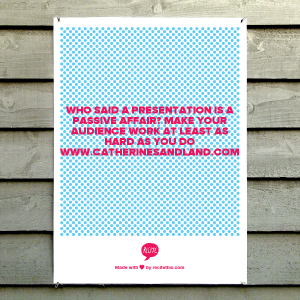 If you would like to know more about how to make your presentations more active for your listeners, then call Catherine on 07946604859 or email with your question. And remember to sign up for Speech Bubbles, weekly inspiration for your presentations.